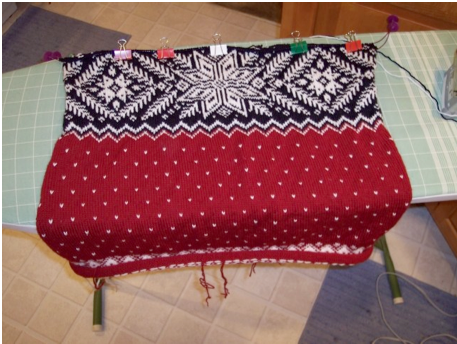 When I was knitting Gjende, I did a lot of unraveling of knitted fabric. 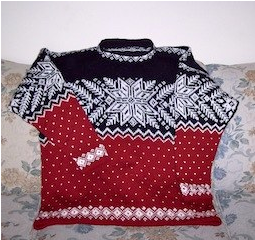 Gjende was my first attempt at a stranded sweater. It was the first stranded colorwork project I undertook using the two-handed method, although I did practice the method before casting on Gjende. It took me a while to get the hang of tensioning the two yarns, especially in that big star section right across the center of the sweater. You know, the part that attracts the attention of anyone who comes within sight of the sweater. Trust me, this is not acceptable, even for a novice strander. So why am I rehashing Gjende? Well, this leads me to my current stranded project, the “We Call Them Pirates” scarf that I am making for podcaster Joe Prova to match the “We Call Them Pirates” hat I made for him earlier this year. The scarf itself is my own design, if you can call it that, in which I incorporate the skull-and-crossbones design of Adrian Bizilia’s “We Call Them Pirates” hat available for free at Hello Yarn. After giving it a lot of thought, I went with a “seamen’s scarf” design where the part of the scarf that goes around the neck is knitted in 2 x 2 ribbing. (That’s knit 2, purl 2 for the uninitiated. 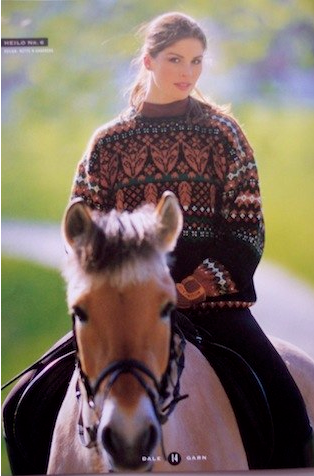 Like the bottom and cuffs of your favorite sweater.) And I’m knitting it in the round so that it won’t have a “wrong” side and will look good no matter how Joe decides to wear it. 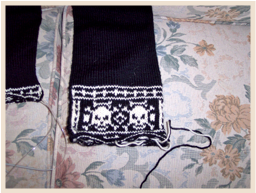 I decided to knit the scarf end-to-end, and when I got to the second patterned section, I just turned the chart upside-down so that the skulls would not be standing on their heads. But after I had knitted a few rounds of the pattern, I realized I had made a grave error. Although the skulls would be properly oriented, the stitches would be going in a different direction and this difference was, um, glaringly obvious. Here’s what I mean. These two pictures of the “fence” part of the pattern are identical, except that I flipped one of them. See what happens when I knit the pattern from the top down instead of from the bottom up? Yeah, the pictures are fuzzy, but you can still see the difference in the stitches. The difference might not be noticeable from a distance, but up close, it stands out like a beat-up ’65 WV Beetle in a parking lot full of brand new shiny Cadillacs. I had no choice. I had to rip it out. I put the live stitches on a holder. Then I cast on to knit the second pattern section separately, from the bottom up, just like the first pattern section. When I’m done with the pattern, I’ll simply graft the pattern section to the live stitches at the end of the scarf. Don’t gasp in horror, dear reader. I’ve grafted so many sock toes in my day that I can Kitchener in the dark. Hyperbole? Yes. But, seriously, I can Kitchener stocking stitch as easily as I can knit and purl. And I’m that one-in-a-million knitter who doesn’t hate grafting. So don’t cry for me. LOL Arrrrrgh, maties!